A fully-functioning demo for 3ds Max, Maya, Cinema 4D, Houdini, and SketchUp with V-Ray for SketchUp, now featuring 5 species in 3 variants, 3 ages and 4 seasons (180 models total). Try our innovative technology for yourself. Five exclusive Laubwerk Plants models, two medium-sized trees species, the compact field maple, and the distinctive Turkish pine, the popular small- to medium-sized Kentia palm and two colorfuly plant species, the common broom, a shrub with yellow flowers, and a small tropical tree, the beautiful red frangipani. Each perfect for ornamental purposes in parks and gardens. Current note for Cinema 4D R19 users: Please either use the installer in custom mode and install R18 plugin to your R19 plugins folder or copy the R18 Laubwerk plugin folder to your R19 plugins folder. An updated installer will be out soon. It only takes a minute to get your free Laubwerk Plants Kit Freebie to order your free download. 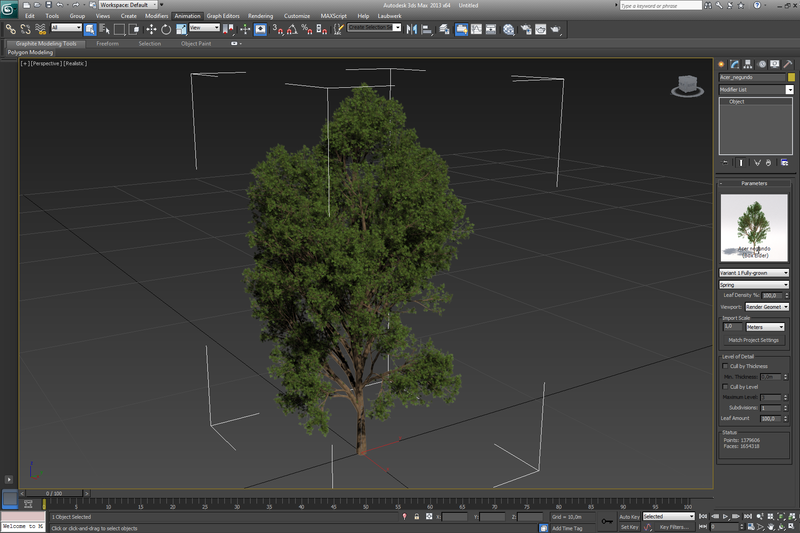 The Freebie allows the use both the included plugin Player and the Plants for your private or commercial CG artwork. The following 4 tree species are included in the Plants Kit Freebie. Each species comes in 36 variations per species, i.e. 3 variants, 3 ages and 4 seasonal aspects, for a total of 144 models in this Kit. A medium-size tree or shrub with a broadly conical or ovoid to round shape. The dark green, usually five-lobed leaves turn bright yellow and occasionally orange in the fall. The tree is widely grown as an ornamental tree in parks and large gardens abd as gained the Royal Horticultural Society's Award of Garden Merit. Perennial leguminous and deciduous shrub with whippy rod-like dark green stems. Mid-green leaves are small, alternate and compound with 3 leaflets. In late spring and summer it is covered in profuse small, bright yellow pea flowers. After flowering, it forms black seed pods, which explode when mature forcefully expelling the seeds. Broom was a symbol of the Plantagenet kings from the time of Henry II. Small to medium sized, slow-growing palm with an upright crown of gracefully drooping leaves. Showy, mostly upright growing, slender trunk, young stems green but turning gray t light brown with age. Dark green, feather-shaped, drooping fronds, which have a smooth, neat appearance. Small star-shaped flowers borne in pendulous axillary clusters of spikes. Small, ovoid fruits, dull red or maroon when ripe, Grows naturally only on the Lord Howe Island group, in the Tasman sea. One of the most widely used and most popular "house plants“. Medium-sized evergreen, coniferous tree with a usually pyramidal to rounded open crown of irregular branches. Nicely patterened orange-red bark on it's trunk. Leaves (needles) are in pairs, long, slender bright green to slightly yellowish green. Stout and heavy cones are green at first, ripening glossy red-brown when 2 years old. Most important forest tree in the eastern Mediterranean area. Popular ornamental tree, extensively planted in parks and gardens in hot dry areas. The species was early introduced to the Italian province of Calabria (in Roman times: 'Brutia'). This spreading shrub or small tree has a short trunk and sparse, open crown with many branches. The dark green leaves are simple, large and thick. The flowers are large, attractive and fragrant. Extensively planted throughout the tropical and sub-tropical regions of the world. Ideal tree for small gardens and roof gardens. Genus named after French botanist Charles Plumier, who explored New World tropics. The Laubwerk Player is a plugin for Autodesk 3ds Max, Maya, MAXON Cinema 4D, Trimble SketchUp, or Sidefx Houdini, that comes bundled with every Laubwerk Plants Kit. It loads the models and allows for easy selection and manipulation of the models, e.g. choose between variations, ages and seasons and allows fine grained control about Level of Detail. See the Laubwerk Player page for a more detailed description. Attractive pricing per Kit, e.g. single user £130 (w/o VAT), two users £220, etc. Laubwerk products are constantly being updated with the latest technology. Keep your Plants Kit up-to-date! To update your Laubwerk Plants Kit 1, log in to your Account Page and download the latest update. Autodesk 3ds Max (2010-2018), Autodesk Maya (2014-2018, Win & Mac, Linux on request), MAXON Cinema 4D (R12-18, Mac & Win), Trimble SketchUp (2014-2017, Mac & Win) with V-Ray for SketchUp or Thea Render for SketchUp, or Sidefx Houdini (currently Apprentice 14-15.5 Win, Linux on request).